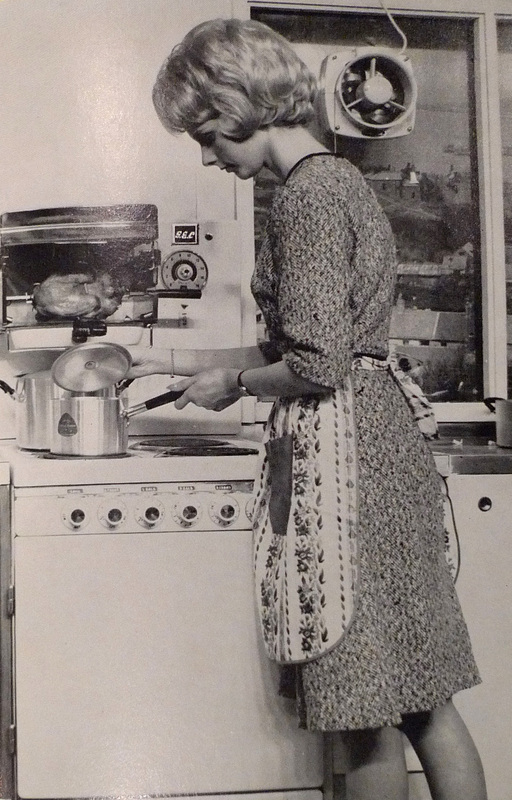 If you are a young bride and have married a man who is finicky about his food, and won’t eat this or that because his mother didn’t do it so…six months of married life will have blunted all your enthusiasm for the kitchen stove. You will have learned to make soup without onions, salad without garlic, dressing without oil – no curry, no out-of-the-way vegetables, no sauce except something out of a bottle. Life will stretch before you as a series of bacon and eggs, cabbage and turnips, and endless varieties of sweet cake. On soups: Add a ham bone, or a bit of salt pork, to the vegetables all diced up, and you have the minestrone that everybody comes back from Italy and raves about, as if the bones of Michelangelo himself were boiled in it. On fish: The first essential in buying good fish is to get to know a sociable fishmonger. On Meat: Passing through a fair in, say, Mullingar, you will see four year old Irish bullocks in the very pink of condition. They have the roving eyes and the debonair looks of first-year medical students…Give them a few more years and they could become a danger to the parish; but now is the time to kill them and eat them, when they are in their youthful prime. I can’t stand sage so I never put it in anything. You are all familiar with the acrid smell of boiled cabbage that rises from the basement of Georgian lodging houses, and permeates the entire establishment, right to the top landing. Terrible, terrible, terrible. There is an absolute horror of a dish known as scotch eggs. There are directions for using every part of an animal – the lamb section is replete with exhortations not to neglect the liver, the brains, the tongue and the sweetbreads and suggestions for cooking them. There’s a famous Christmas cake section that is still followed faithfully by many Irish cooks. And I was delighted to find one of her funniest pieces, ‘A Surfeit of Snails’, reproduced as a whole in the Irish Times. Finally, no small part of the enjoyment of this book comes from the photographs, and the drawings by Wm. G. Spencer. This entry was posted in Food and tagged Monica Sheridan. Bookmark the permalink. A fun read, Finola! Monica’s Kitchen sounds like a treasure. I’m going to have to track down a copy of this book! It looks quite wonderful. I can’t agree with her about the scotch eggs, though … they are the quintessential pub snack. Our scotch egg provider (Paul the West Cork Pie Man) agrees with you. He is planning some unique approaches to the scotch egg. Besides pub food – it is the perfect hiking lunch.